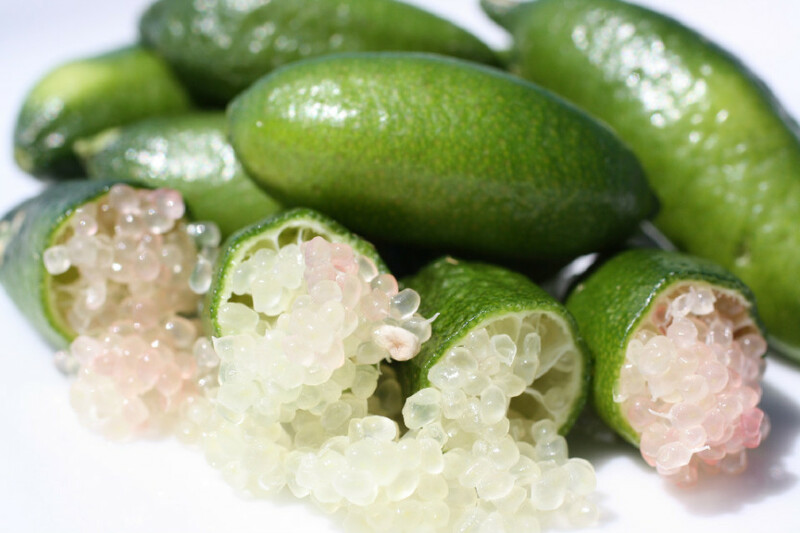 Finger limes are often referred to as citrus caviar due to the delicate “crystals” of pulp contained within the fruit. They are a small leafed, spiny native citrus with insignificant flowers, that do not have the usual beautiful citrus perfume. So why would you want to grow them? Several years ago I tasted native finger lime on some oysters and was utterly entranced by the fresh, crisp, effervescent sensation that happened when I tasted the pulp. Having then seen the outrageous prices being asked for the fruit in the shops, I was keen to try and grow one, so when I saw plants for sale two years ago, I purchased one. I didn’t really know anything about them, so I did some research and found that the native lime occurs naturally in subtropical to tropical areas of Australia, so I did not attempt to grow it in the ground in the Southern Highlands as it would have been too cold for it to survive well. I did, however, pot it up into a 40cm x 40cm pot and used the best quality potting mix I could find. This allows me to put it into a warm spot (glass house) in winter. But for anyone on the east coast, a warm sunny north facing protected area would be fine during the colder months. In late spring I move it into the garden where it gets full sun. I water it regularly and fertilise it with Powerfeed ever couple of weeks. I tip prune it whenever it puts on new growth to keep it nice and compact. I intend to repot it into a slightly larger container next autumn after harvesting the fruit. So far it has not been troubled by any pets or diseases. 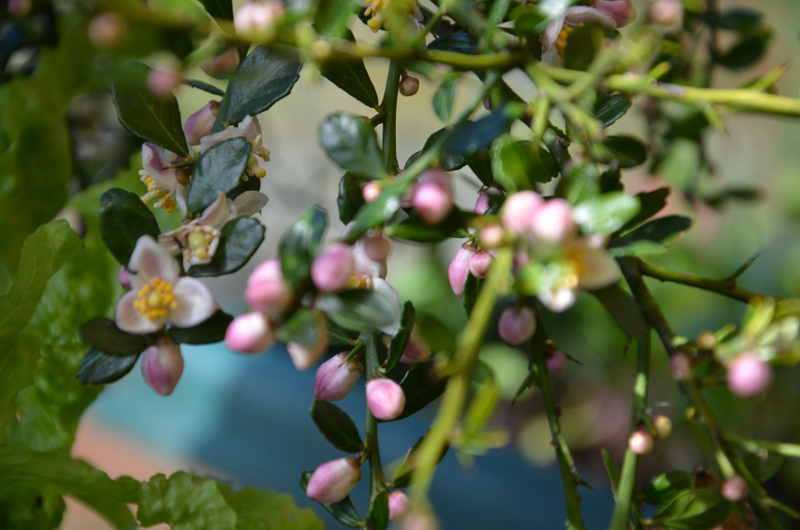 It flowered prolifically last spring and in autumn I had about 6 small 8cm long brownish fruit that contained pale pink flesh. The pulp was delicious and we used the small amount we had as a garnish on oysters, in both sparkling mineral water and champagne to add and citrusy bite and added it to salads to add texture and that lovely citrus taste. The finger lime is flowing again at the moment and I am looking forward to harvesting fruit again next autumn. So if you see one for sale, have a go at growing one. They are easy to grow, relatively simple to maintain and will give you a lovely and interesting addition to your annual harvest. If you do decide to give a Finger Lime a go, I want to know about it! You can post a picture or review on my Facebook page, or show me a pic over on Pinterest. 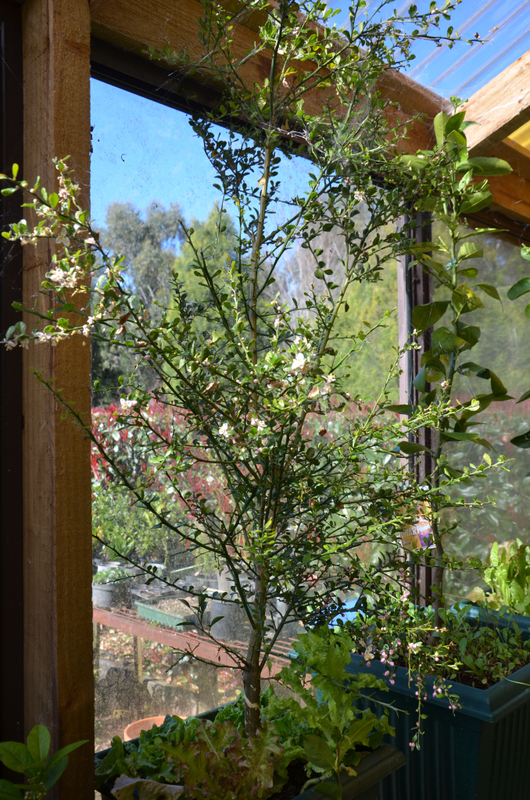 Learn more about growing citrus trees in pots here. Learn how to prevent fruit fall in finger limes here. Thank you for the compliment! The entire reason I grow all of the food I do is because I love being able to pick fantastic fresh food everyday. Your tree looks awesome, I would have thought they’d grow a lot slower than that. Where do you live? I just bought 2 types of finger lime, 2 of those Australian blood lime hybrids, a kaffir dwarf and an Australian desert lime. I’m in Perth so sunshine is endless, winter can be a little bit cold maybe some brief periods of 5 degrees but never frost where I am. I’m a little worried of the coldest nights, and the 43 degree days in summer. Hi Dutchy All the citrus you mentioned should do just fine in Perth. I am in the southern Highlands of NSW and we get massive frosts and whilst the citrus do Ok your climate is far better suited to their growth. If you are worried about the cool nights try growing the finger limes in containers and moving them up against a north facing wall( brick is best if you have one) for the duration of the winter. wow, what a big beautiful plant. I live in the Netherlands and I wish I can have such a plant here. You can try. I live in northern Illinois and mine is doing great! I have a small finger lime tree that was grown from seed purchased from Australia a number of years ago. I wonder if this tree will grow any fruit, as I read that finger limes grown from seed will not likely bear fruit. It is about 3′ tall. Any thoughts on that? Theres no reason that the finger lime shouldnt fruit, but sometimes they do take a bit of time to get to fruiting – the same with any fruit trees! Im amazed though that you were able to get the seeds out of Australia! That gives me hope. Thank you. Actually it was a friend of mine who got the seeds. I think she just ordered them online. Do they self pollinate, or do you help them along? The bees should be able to do it for you unless they’re massive. In Perth we have aussie bees and european bees they both have no problems getting through the maze of spikes. That is a good idea, but as I don’t a garden, just a balcony, I will definitely hand pollinate. I will not leave that to chance. If I ever get blooms, I will definitely use my pollinating brush. I live on the 14th floor of an apartment with a huge balcony so don’t get many bees up there. I will help it along. Thanks again. And approximately how old or big does a finger lime have to be before producing fruit? My finger lime, which I am growing in a pot, was only 3 years old and about 1.5 meter high when it started fruiting. From seed it could be 5-10 years. They sell grafted ones in America, not sure about Canada. If your friend who gave you the seed does some pruning take all the cuttings and try to grow them for faster fruiting. Thanks for the detailed information. I recently purchased two finger limes which I found in the shade house in a local nursery. I kept them in a hothouse until our weather was clear if frost however they yellowed severely and dropped leaves despite a good number of blooms. I do hope they will survive I have fed them with liquid seaweed…..any other suggestions? Hi Ortoneza – If your finger lime has come from a shade house to a hot house it may have been a bit of a shock. Finger limes are an understorey plant ,that is they grow in the shade of other trees, so going into a hot house with much brighter light may have caused them to go into a massive stress attack hence why they dropped all their leaves. The liquid seaweed was a great idea to help encourage recovery, but now I would feed them with a growth promoting substance like powerfeed to encourage leaf growth. Also pop them into a shelter partly shaded position. Thanks for the encouragement. I do hope it survives too. I live in San Francisco, and recently purchased a couple of finger limes at a farmer’s market. I guess there’s a nascent industry of them here. Anyway, on a whim I decided to plant one of the seeds from one of the limes and after a couple of weeks (and to my complete surprise) it sprouted. Any tips on growing one from scratch? Also, any thoughts on what to do once it gets big? Although it’s not all that cold here (rarely gets to freezing), it’s very windy and summers are relatively foggy and cold, so it may not survive & thrive outside. As for growing from scratch just keep watered and feed as you would for any citrus.Finger limes are proving to be really tough plants and the fact that they are are understorey plants then then the cooler summer may not be a limiting factor. The wind however may be a problem so I would protect them as much as possible. Hi, I have two finger lime trees here in California but the fruit they produce is really tiny and often is labor intensive to get the crystals out, how big should the fruit be and what can I do to help it produce larger fruit, mine are really tiny and thin. I get lots of blossoms and the tree seems healthy but so far only about 20 limes each season. Hi Geetha try using a seaweed based solution weekly on your plant once it starts flowering. Hi Geetha, try apply a seaweed type solution ie seasol weekly once flowers open and make sure it is in a spot that has plenty of pollinators.ie lots of spring flowering plants. I live in Melbourne and have just purchased some finger lime seeds. Various sites say the success rate for growing seeds isnt great.. Is there anything I can do before planting them that may help them? I.e. put them in wet cotton wool first until they start growing? Hi Peter I would plant them into a good quality propagation mix, covering them with the mix at a depth of about twice the size of the seed. Keep moist and warm, 20-25 degrees Celsius. They should germinate in 14 to 20 days. I live in northern Illinois and have one. It has fruited within a few months after getting it. It’s indoors now.